U.S. big-box retailer JCPenney is currently testing Apple Pay support for its store cards, with plans for an official introduction sometime in the spring of next year, a shopper's anecdote indicated on Monday. 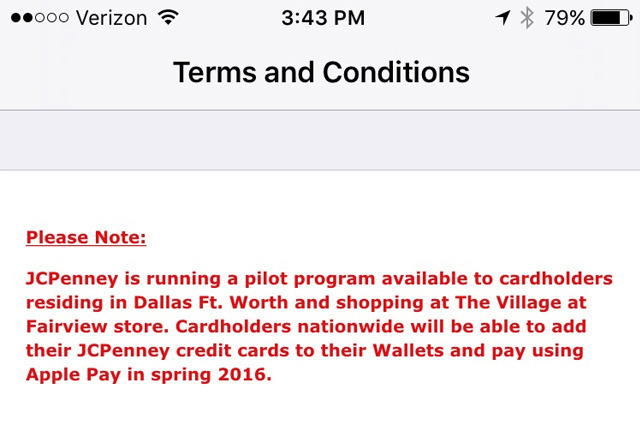 The person recently tried to add his JCPenney card to iOS 9's Wallet app, and was met with an unusual Terms and Conditions page, according to a post on the MacRumors forums. A notice at the top of the page explained that JCP is running a pilot program out of the Village at Fairview outlet northeast of Dallas, paving the way for the spring rollout. Apple and JCPenney have yet to officially confirm the plan. Store-based credit cards are a relatively recent addition to Apple Pay, the first example being Kohl's in October. Other companies like JCPenney and BJ's Wholesale Club were announced as Apple Pay partners in June, but have since stayed mostly silent. At the moment, JCPenney doesn't even support Apple Pay via other cards at its sales terminals. That will presumably change by the time the retailer's own cards are an option.